The Wind Powered Generator System is a combination of many common automotive parts. Automotive wind power is a new area and incorporates as a secondary layered roof. The air velocity or wind turns the fan blade when either vehicle is in motion or not, producing an electrical current. The issue it deals with is weaning the population off of oil (for the most part) and abstain from a heavy reliance upon the electrical grid that would be heavily taxed if and when EV's (Electric Vehicles) become affordable to all consumers. This invention truly relies upon a forward motion more than the wind but the wind can be utilized also. The laws of physics come into play with understanding by the action of the forward motion causing the fans to turn and thereby producing electrical current to charge the battery and being regulated on the amount of current put forth so as to not burn out or kill the lithium batteries that are currently being implemented in the EV's. This invention will keep the battery charged at the right limit and hence there is no need to plug in and the consumer who owns and EV will have no concerns of where to re-charge because it is charging as they are utilizing the EV for transportation! At this point, if the price is right, an outright sale. But if not, then a license with royalties is our preferred option. We have never tried selling this invention but we have tried marketing to private investors on our own. Obviously, we are not good pitch people. It's not our forte. This patent is the CIP (Continuation in Part). There is the original patent that was first generation. We feel the second patent is better in design to fulfill what we intended for the first. 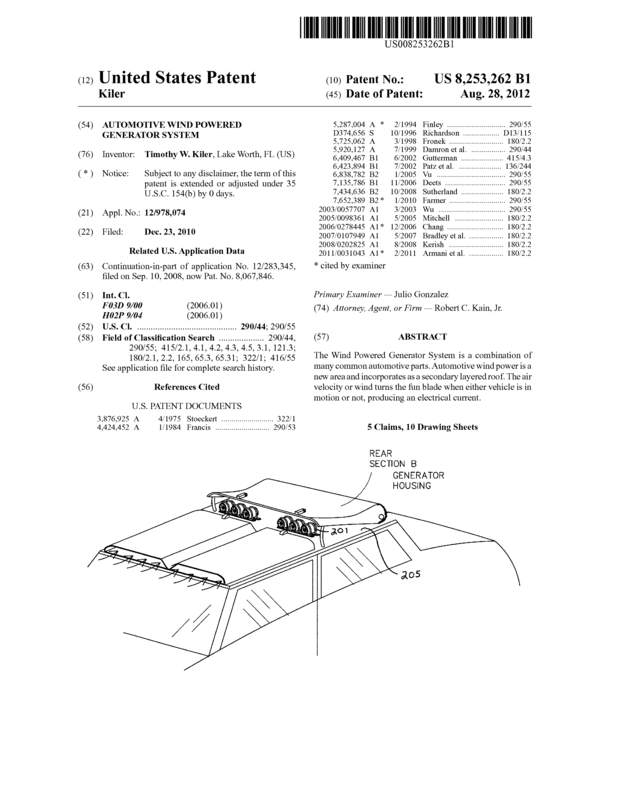 Page created at 2019-04-26 18:25:52, Patent Auction Time.